The proposed bridge would connect sections of Van Cortlandt Park split by the Major Deegan Expressway. This story is a product of the City Limits Accountability Reporting Initiative For Youth (CLARIFY), supported by the Pinkerton Foundation. Learn more about the program here. If good things come to those who wait, the years of waiting on the pedestrian bridge at Van Cortlandt Park has been a test of virtue. 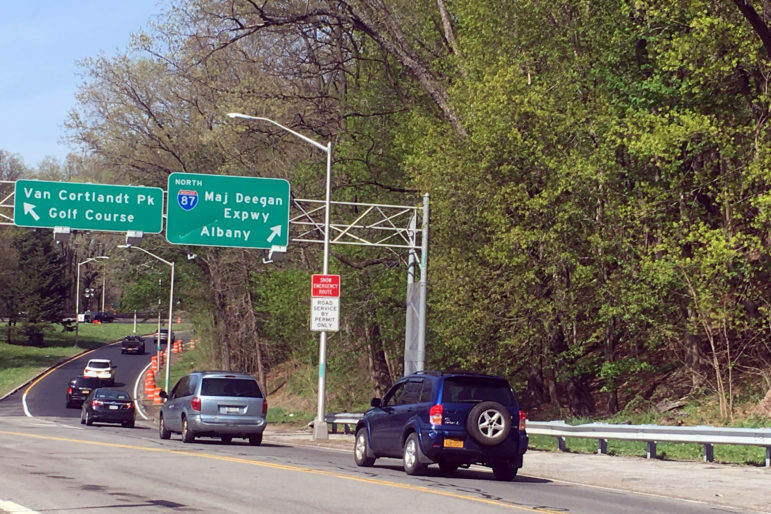 For nearly two decades, community members have clamored for a bridge traversing the Major Deegan Expressway where it cuts into and splits the park. The project has been in discussion since 1999, and the city formally announced its plan to construct the bridge with a press conference in 2015. This test of patience, however, is not yet over. The bridge, to be located just south of the 233rd Street exit off the expressway, has been pushed back yet again, and the city needs an additional $9 million to get the plan off the ground—with a new budget of approximately $21 million, according to a recent update by Community Board 8. The new price tag is a far cry from the $12 million previously estimated for the span. The city’s Department of Design and Construction, which is overseeing the project, says the current budget includes expenses left out of the original estimate, including designs, tree restoration, materials testing and engineer services, according to a spokesman. Another factor in the cost increase was a location change, the spokesman said. The original location for the bridge was about 750 feet further south, but it was too close to city aqueducts carrying water from upstate reservoirs. After a request from the Department of Environmental Protection, the bridge site was moved, and designs for the span and ramps increased in length, according to the DDC. Unfortunately, delays with the project are not new to Christina Taylor, executive director for Friends of Van Cortlandt Park (FVCP), an independent organization focused on maintaining and improving the park. “It’s ridiculous,” she said, saying the group has been pushing for construction of the bridge since 1999. At the time, the DEP agreed to fund the bridge if it found the project to be feasible—part of a deal struck when the city chose the park as the future site of the Croton Water Filtration Plant, Taylor said. After 10 years of waiting for a feasibility study, local City Council members got involved and city officials finally announced in 2015 that they’d secured the $12 million needed to build the bridge: $4 million from the DEP, $4 million from the Parks Department, and $4 million from the state. The project was supposed to wrap up in 2019. Now, the DDC says construction won’t start until 2020. A spokesman for the agency said the city will come up with the remaining funds needed to meet the $21 million budget, but did not provide details on how that would happen. “By the time they find the other $10 million, the price is only going to go up. The prices seem to only go up,” she said. And she had something to say about the high price, too. While Taylor said there has been some pushback from community members about the plan — with some asking why people simply couldn’t walk a bit farther — she explained that people who avidly used the park know how difficult traveling around the green space can be. The bridge would finally connect walking trails on both sides of the Expressway, making it easier for park-goers to get around. “People who really use the park, and understand and use the trails and know how difficult it is to get around, really are supportive of it,” Taylor said. According to the DDC, the bridge should be completed by the end of 2021. With additional reporting by Jeanmarie Evelly. The memo lists the coalition's serious concerns regarding the potential displacement of current residents around Broadway Junction, and states that they are opposed to any rezoning of the area. The City Council will now take up the sixth neighborhood rezoning it has considered during the de Blasio administration, and the first one on Staten Island. There’s a bridge — with sidewalks — extending Jerome Av over the Maj Deegan immediately north of East 233rd St, and there’s a pedpath under the Maj Deegan adjacent to Mosholu Pkwy. The Big Problem: electeds, the Dept of Parks and Recreation, and the city’s Dept of Transportation love to build new stuff, and they love ribbon-cuttings, but they do a Really Bad Job of maintaining existing stuff. Pedpaths related to the two crossings I noted are in poor repair, and that’s a euphemism. I suppose the Department of Redundancy Department could justify spending Big Bucks adding yet another crossing, but I think the money would be better spent maintaining and improving what’s already there. Support local, investigative journalism that has informed and empowered New Yorkers for over forty years. It’s uncertain how many stations the MTA considers ‘possible’ for accessibility. Some, maybe several, may never be able to accommodate wheelchairs. Who’s Funding Former IDC Members and their Primary Challengers? Seven of the former Independent Democratic Conference members face primary challenges, but nearly all the incumbents enjoy heavy financial advantages. The proposal is one of several included in the city’s North Williamsburg Traffic Study, which is aimed at improving traffic flow and safety. — Evie on One Year After the Rezoning, Has Jerome Avenue Changed? Got a Question About New York City? We’ll track down an answer.